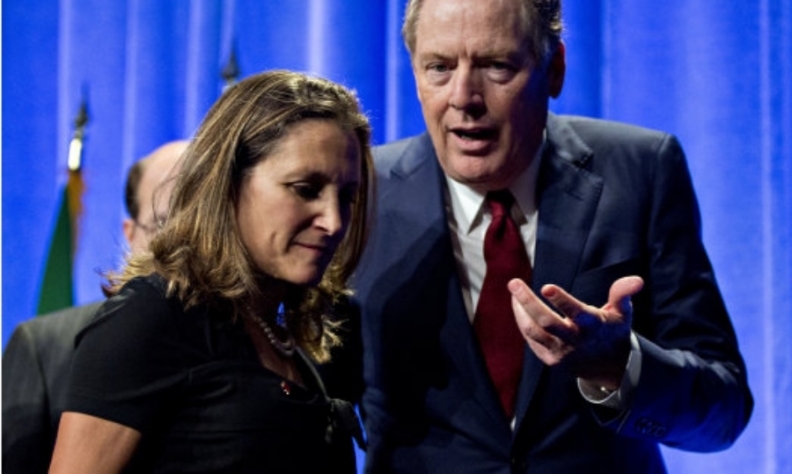 The renegotiation of the North American Free Trade Agreement is entering a pivotal moment as the United States turns up the pressure on Canada and Mexico to radically alter the trade pact in favour of American interests. In the run-up to the sixth round of talks that are now underway in Montreal, there has been plenty of sabre-rattling and posturing from the three countries. But through it all, a somewhat consistent pattern emerged: U.S. President Donald Trump kept threatening to withdraw from the pact while Canada and Mexico suggested they’d bring fresh thinking to the table to try to resolve some of the touchiest issues. The question now is whether they can move forward fast enough to salvage the deal before electoral politics overwhelm the agenda later this year. The latest session to revamp NAFTA began Jan. 21 in Montreal and is scheduled to last through Jan. 29, making it the longest round yet. The 24-year-old trade pact is a key linchpin for the United States, Canada and Mexico, which trade more than US$1 trillion in goods annually. Any of the three can quit after six-months’ notice, though Trump is the only one to regularly threaten to give it. Trump has lately tied the talks to his push for a border wall with Mexico, while the United States is also growing impatient with Canada’s perceived unwillingness to compromise, according to two people familiar with the talks who spoke on the condition of anonymity. At the same time, there are pro-NAFTA signals coming from the Trump administration, including Agriculture Secretary Sonny Perdue who said in an interview during the week of Jan. 15 that Trump shares his view that NAFTA has benefits for U.S. farmers. And signs have been mounting from Canada and Mexico that they will be more flexible in trying to score a breakthrough in talks. Mexico hinted it could bend on automotive rules, one of the most explosive issues, while also saying that officials agree broadly on 40 per cent of the pact. Canada, meanwhile, has said it will bring “new ideas” to the talks, and that several topics, known as chapters, are close to being concluded, even as Canadian officials said the chance of a U.S. exit is seen as increasing. There is a handful of key disputes over U.S. demands. They include autos, where the United States wants to raise the amount of a car that must be built in the three countries to be traded under the deal. Another hot button issue includes adding a sunset clause to terminate the pact after five years unless all three countries agree to renew it. Canadian Foreign Minister Chrystia Freeland and Mexican Economy Minister Ildefonso Guajardo will meet in Toronto on Jan. 22. The two ministers along with Lighthizer are scheduled to make a joint statement on the closing day of round six, while the seventh session of talks is set for February. If the negotiations drag on too long, they could run into the political calendar. Mexico holds a presidential election July 1 and U.S. congressional midterms take place in November. Trump indicated this month that he could be flexible with talks ahead of the Mexican election -- and then repeated his threat to withdraw if he can’t reach an agreement that’s “fair” for America.